Our 100% web-based and mobile-friendly platform enables our clients to easily manage the entire building process from start to finish on behalf of owners, including developers, corporations, and institutions anywhere at ANY time using ANY device! Projectmates' Cost & Change Management modules go far beyond simple Budget tracking. With the ability to easily track all funds including Budgets, Encumbrances, Expenditures, Invoices and Change Orders at the Program and Project levels, you can quickly and easily see a snapshot of your project/ program fiscal health. 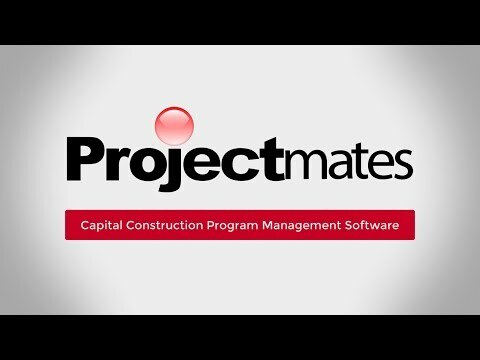 Projectmates itemizes costs for each project phase by budget/fund code as well as WBS/section and provides details of shortfalls and overruns throughout the program/project duration. Our Cost Management component has real time relations to the Reporting and Dashboard components and enables viewing of funding allocations and expenditures by project and by bid package. With Projectmates, you can set up email notifications to alert you in advance of exceeding your costs. With a notification workflow in place, you will always have the opportunity to view your pending costs prior to approving them. Projectmates enables you to act proactively rather than reactively. Projectmates includes over 40 different modules, making it one of the most complete project management products available today. It provides a workflow process engine that works uniformly across all the business capabilities including budget, contract, change, invoice, design, correspondence, scheduling, and vendor management at the program or project level. Because Projectmates comes with most of the workflows pre-configured, implementing these processes is very simple. The Custom Business Process engine enables you to easily configure your own custom workflows. Each workflow works in conjunction with the application security, and is tied to the Roles and Access Rights within a project or program. Projectmates provides you with unprecedented control over your project/program data. Our Reporting Module is 'Best in Class,' providing over 150 pre-built reports as well as an ad-hoc reporting engine, which enables you to create your own custom reports using simple drag and drop technology. Projectmates' Ad-Hoc Reporting enables you to group your data into categories like Fiscal Year, Project Name and Project Manager. Projectmates also provides comprehensive analytics & dashboards across all modules to provide quick snapshots of your project/program fiscal health using colorful graphics, which make it easy to identify important information at a glance. If you need to drill into the information further, a live link is there to take you directly to the selected data to quickly take action. Projectmates functions in any modern web browser inclduing Chrome, Firefox, Safari, IE 10 and IE 11. Projectmates works seamlessly on a desktop, tablet, and smartphone with modern responsive design. We understand our clients' need for a powerful tool that offers flexibility along with versatility. In addition to desktop browser-based software, Projectmates provides a mobile app that works on all smart phones where you can easily access your projects from the job site or office.